E-copy provided by the author in exchange for an honest review. Zara Hamilton has it all—a glamorous New York lifestyle, a gorgeous (and seriously rich) boyfriend, and a job as a lawyer in a prestigious city law firm. But when Zara’s boyfriend is accused of insider trading, her perfect world implodes. Thrown out of work by security and stalked by the press, Zara’s life can’t get any worse. Or can it? A snap decision (and a few wines too many) sees Zara fleeing to Africa to work as a temporary wildlife volunteer. But just when things start to cool down at home, Zara realizes her troubles have only just begun. Will Zara’s designer wardrobe survive? Will a supermodel ruin her only chance at happiness? Can a Birkin bag really solve her problems? This is a cute, fast pace, thought provoking, but very much chicky enough to satisfy your contemporary taste. Kate Metz is a terrific writer touching on social issues, humor, and of course romance in her spunky new novel. I loved the cultural aspect of the story; the fact that a city girl got placed in a situation where the life she's used to has to adjust to a life she had no clue about. It was certainly a learning experience that changed Zara's mindset for the better. Stiletto Safari was indeed an eye-opener; depicting the significance of basic needs that many, including Zara, usually take for granted. Of course amidst the seriousness of the situation you can't help but find the main character's personality adorable. Her love for fashion and glamour is quite entertaining. My favorite part of the book is when Zara brought out her iPad so the students could watch movies. Their fascination to such things had me in awe. Other highlights include Zara's growing feelings for Hamish and the misunderstanding during their first encounter. I too was baffled by his charming character after that "bimbo" comment. The new friendships were just as precious as the ones back in New York, and the environment offered plenty of mystery to keep Zara and us readers interested. The writing was well done and not too rushed; details were kept balanced and meaningful. There's never a moment where I was bored or felt confused. This is the work of a debut author so I must applause her on such a flawless technique. One word, brilliant! I could go and on about how wonderful this novel is but then I'd probably end up spilling too much details so all I can say is please read and enjoy it for yourselves. 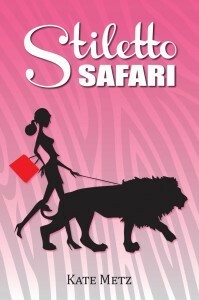 Overall, Stiletto Safari was a short read that took me more than a day to complete due to my various commitments but I absolutely enjoyed it while it lasted. At first I thought the book was going to be about a bunch of wealthy people, lawyers, and the controversy Zara was caught up in, that's because I avoided reading the synopsis before hand. In return, I loved the intended structure and setting. This was an awesome book reminding us to not get swallowed up in material things, to appreciate what we have, and to always do our best to help others. Great debut Kate! Kate Metz lives in Melbourne, Australia. She has travelled widely and has spent time working as a wildlife volunteer in Namibia. She has been attacked by a leopard, gone swimming with baboons and elephants, managed to electrocute herself while feeding lions, taught in a bush school and has had plenty of wonderful experiences along the way. Great review this sounds very different from anything I've ever read I'm intrigued! !